1. Culture the milk. Pour the milk into a large (at least 8-quart) pot—I typically use an 8-quart enameled cast iron Dutch oven or a stainless steel 12-quart stock pot. Stir in the buttermilk, attach an accurate thermometer that registers temperatures as low as 75 degrees and set the pot over medium heat. When the temperature reaches 75 degrees, turn off the heat, cover the pot and let stand 3 or 4 hours. 2. Set the curd. If using citric acid, stir it into 1/4 cup cool water, continuing to stir until dissolved. Uncover the pot, set over medium heat and stir in the dissolved citric acid or the fresh lime juice. 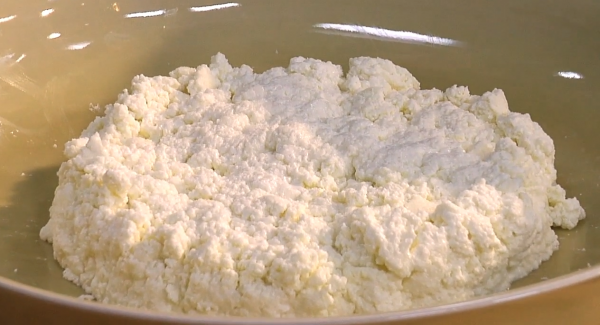 You will immediately see small curds start to form. Every couple of minutes, stir slowly, gently and thoroughly over the entire bottom of the pot until the milk reaches 195˚F—it’ll take just over 20 minutes. At this point the curds will very obviously be floating in the milky-transparent whey. Remove from the heat and let stand 5 minutes without stirring. 3. Drain the curd from the whey. Wet a large piece of cheesecloth and drape it into a large colander. Set the colander in the sink. Using a large slotted spoon or a fine-mesh skimmer, carefully ladle all of the curd into the colander. Gather the cheesecloth up around the curd and gently press with the back of a large spoon to expel a bit more whey. Unwrap the curd onto a plate, break it up and sprinkle with 1 teaspoon of the salt. Work in the salt with a spoon or your fingers. 4. Finish the cheese. Gather the cheese curds into a 1-inch-thick disk, transfer to a plate, cover and refrigerate until thoroughly chilled. The cheese should last about 1 week in the refrigerator. Husband and I just finished one of our week-end projects of making this fresh cheese. Simple and clearly understandable recipe. Enjoyed making it, and now will enjoy eating it together. Always enjoy the show on Saturday and now look forward to trying out a lot more of the recipes. I am planning to make this. Are there any suggestions for how to use the leftover whey? I would hate to just throw it away. Hello,,very good tv show is very good,i love it,i have 1?,I not have buttermilk,what I can use for sustitut and if is necesary? ?